The Adventures of Tioga and George: No Leak! Water was just run down Scampy's kitchen drain. Excitedly, George went outside to take a look at the grey water tank. Is it leaking? Is the leak fixed? Reader and Friend Brian texted that I was close to his home. Would I care to go to breakfast? I said, "Yes!" 3M Marine Adhesive Sealant 5200. Brian holding the tube of 3M sealant. So far, only one test-piece installed. 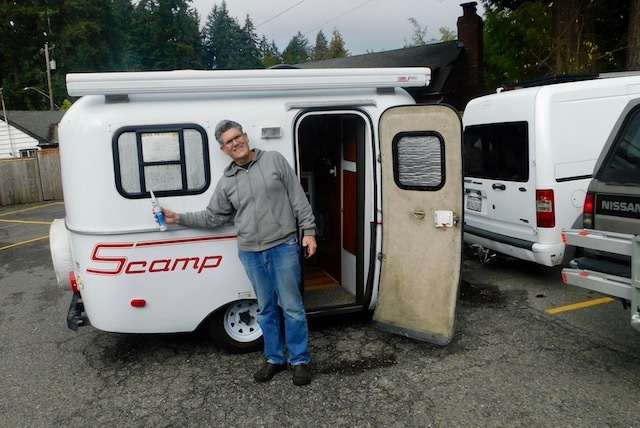 The Scampy Team headed south on I-5 with no particular destination in mind. As we were passing East Lake, we saw a great view of the Seattle Space Needle off to the right. In prior times, George would have grabbed Little iPhone and captured a pic of the Space Needle while still driving Señor Tránsito! However, after the recent Ditch and Collision Accidents, George made a deal with himself to stop doing this kind pucky. 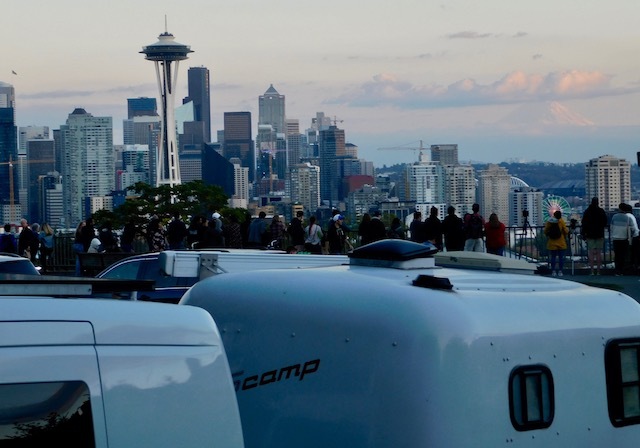 So, the Scampy Team pulled off the interstate and began a search of Seattle streets in order to locate a fantastic view of the Space Needle! We drove down to the pier. We drove up in the Seattle hills. We considered parking and finding a high-rise with a view. Nothing! Then we headed to where the area where the ferry boats dock. We had been looking for a place to stop and go online for info. And finally found a parking near the ferry dock. 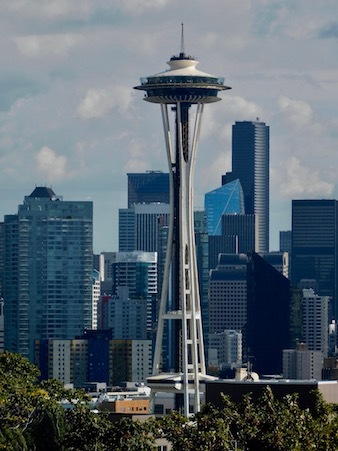 "Where to view the Space Needle." 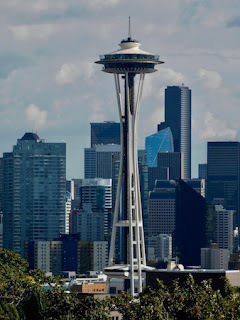 "The 6 Best Views of the Seattle Space Needle......."
Click [Here] to find out why we picked Kerry Park for the site to capture our Seattle Space Needle pics! Our new Nikon B500 captured this pic. Whattaya think? We are camped just across the street from Kerry Park. As the light changes, Nikon B500 captures another pic. We have no idea what we are going to do with all of these pics. It will be good enough if by taking all these pics, we just learn about how the camera works! 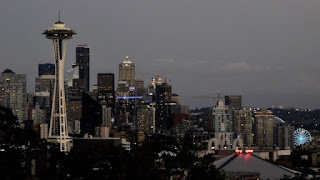 The beginning of evening time at Kerry Park. PS: Look at our 1:05 pm Blog post for what's to fix next! A fixed leak is a good thing! So, you know about fixing leaks? "Fixing a leak is just about as good as it gets ?" The only thing better than a fixed leak is no leak at all! "To share the vagabonding life with our fellow RVers like yourself. We hope that you will try to boondock and dry camp. We have found great joy in camping away from the RV Campground. We would like you to try our camping lifestyle yourself. Sharing with you our Daily Adventure is our way of encouraging you to try to camp as we do." Reading your comment has MADE MY DAY! And thank you Mr George. I’m happy that you’re happy! Great job with the leak and the photo! It is great that you took the time to find a great vantage point for the photo. Thank you so much for your compliment to me for fixing that leak. I got really lucky! If the leak had not sealed off, I would have had to buy a new tank from a Canadian manufacturer! Whatta difference taking pics with a real camera compared to an iPhone! Fun pics! I lived in Seattle 3/73-12/74. Great place! I agree! Taking those pics of the Space Needle was a fun time for me too! I just realized that I have no way to contact you! I wanted to text a BIG THANK YOU! to you for the very thoughtful 3M 5200 installation that you did for me! A ferry ride from or to Seattle is spectacular on a nice day. I used to ride from Bremerton as a walk on and spend some time on foot in Seattle then take the hours trip back to my car. 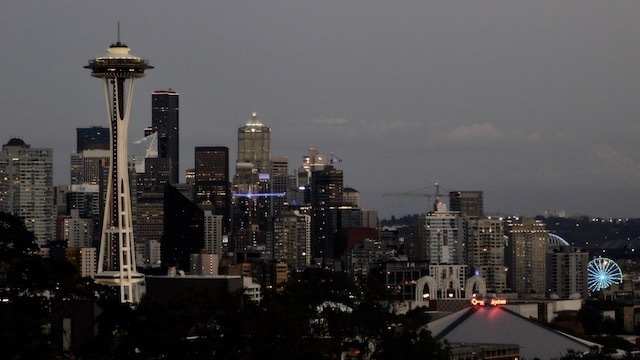 From the comments received from Readers about the Seattle area, it appears that it is a fabulous place! Many years ago I went to Whidbey Island (west of you) and drove the bridge over Deception Pass, I can still remember that! We'll be back in that area next summer, I need to make a point of it.. Sounds as though you had an exceptional experience on Whidbey Island! Thank you sooooo much for sharing. 3m5200 Is a very very good marine product. It’s an extremely strong adhesive, and it seals virtually everything against water. I started using 3M 5200 with my last motorcoach about nine years ago. I haven’t found anything where it wouldn’t do better than anything else on the market. Brian was very generous to give you a tube of it. Keep up the good work. I agree with you about Brian! Should've asked Brian if he is building a boat,5200 pretty awesome stuff. 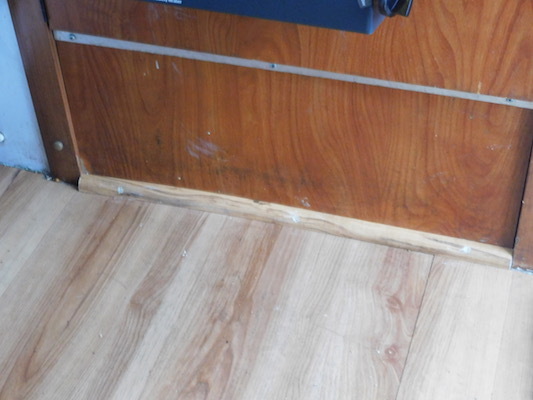 That is a boat builders go to glue, predominantly used in the wood boat building industry. Brian has worked on the ocean for many years. Pretty cool that he bought me a tube of 5200 and applied it to the leak place for me!